Salvador Dali’s 1962 painting Coeur-Sacré de Jésus is offered at Bonhams Impressionist and Modern Art Sale, 22 June at Bonhams New Bond Street, London. Coeur-Sacré de Jésus is estimated at £800,000-£1.2m. Modelled with thoughtful academic technique, Coeur-Sacré de Jésus is an exceptional example of Dali’s work from the period following his return to religion and classicism. The prevailing influence of the Renaissance Masters on Dali’s Christ is evident, particularly that of Francisco de Zurbarán, whose realistic paintings of monks, nuns and martyrs featured strong contrasts in illumination. The oil on canvas offers an insight into Dali’s personal beliefs at the time. Dali’s spiritual awakening, which was derided by the Surrealists with whom he had been closely associated in the 1920s and 30s, has been read as a desire for peace following the social and psychological dislocation stemming from the Spanish Civil War and World War II. The painting was the result of a commission from a devout Catholic philanthropist, American businessman Harry G. John. This allowed Dali to convey the sincerity of his renewed beliefs. 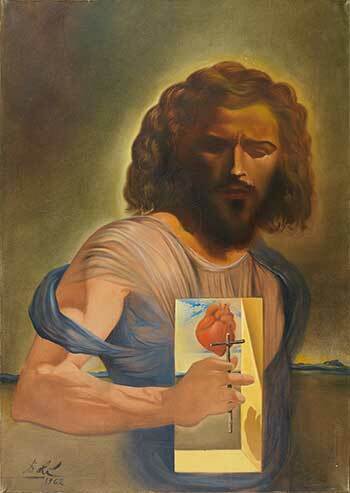 India Phillips, Bonhams Director of Impressionist and Modern Art said, “Salvador Dali’s Coeur-Sacré de Jésus is a wonderful illustration of the artist’s theory that heaven is to be found in the heart of the individual, attained through the very act of belief.